The evolution and maintenance of sexual reproduction is believed to involve important tradeoffs. Queens of social insects face a dilemma over the costs and benefits of sexual and asexual reproduction. Asexual reproduction by a queen doubles her contribution to the gene pool. However, overuse of asexual reproduction reduces the offspring’s genetic diversity and thus the colony’s ability to adapt to environmental stress. 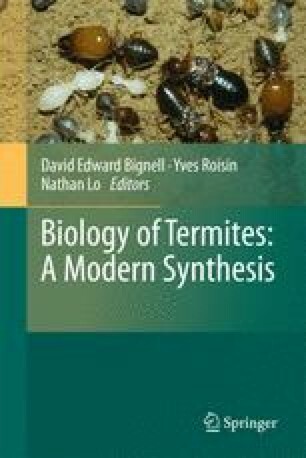 Recent investigations on breeding systems using molecular markers revealed that queens of some termites can solve this tradeoff by their conditional use of sexual and asexual reproduction, where queens produce additional (and/or subsequent) queens by parthenogenesis, but use sexual reproduction to produce workers. The asexual queen succession (AQS) system enables the primary queen to maintain her full genetic contribution to the next generation, while avoiding any loss in genetic diversity from inbreeding. In other words, this system gives, in effect, genetically eternal lives to the primary queens. In this chapter, I discuss how eusociality, with its attendant caste structure and unique life histories, can generate novel reproductive and genetic systems with mixed modes of reproduction. This provides important insights into the advantages and disadvantages of sexual reproduction. The study on asexual queen succession was conducted by collaboration with Edward L. Vargo at North Carolina State University and Kazuki Tsuji at University of Ryukyus. I am grateful to L. Keller. K. Ross, N. E. Pierce, D. Haig, P. E. Labadie, D. J. C. Kronauer, K. Shimizu, T. Yashiro, K. Kawatsu and H. Nakano for helpful discussion.